An award ceremony is a day when winners and losers come together to celebrate the magical medium of cinema. At the 49th Filmfare Manikchand Awards, Hrithik Roshan and Preity Zinta walked away with the Best Actor and Actress Awards for their roles in Koi... Mil Gaya and Kal Ho Naa Ho respectively. Held at Mumbai's Bandra Kurla Complex on Saturday, the event was hosted by the Kal Ho Naa Ho duo Shah Rukh Khan and Saif Ali Khan along with Archana Puran Singh. The evening began with awards for technical excellence. Kabir Bedi and Udita Goswami gave away the award for Best Action, Art Direction, Camera and Editing to Allan Amin (Qayamat), Muneesh Sapeel (Pinjar), Aseem Bajaj (Chameli) and Shimit Amin (Bhoot) respectively. Pyaar Hai] and won two awards. If he needs someone for his next film, main hoon na." Main Hoon Na is the name of Farah's soon to be released directorial debut. Real life sweethearts John Abraham and Bipasha Basu sizzled on stage with their hit songs from Jism. Mil Gaya, by dressing up like Sanjay Dutt and the alien Jaadoo, the Khan reprised the deathbed scene of Kal Ho Naa Ho with not-so-subtle homosexual overtones. Mil Gaya's alien) were to get married, on the wedding night, Jaadoo wouldn't be able to do it because he would need dhoop (sunlight) to perform. For the uninitiated, the film shows that Jaadoo derives all his power through the rays of the sun. Luckily for the Khans, Preity took it in good humour. As for Aamir Khan, SRK remarked, "We can never be like you," and Saif cut in, "Yeah, we are taller." Wonder what The Rising star has to say. SRK mocked Saif, "Zabaan ko lagaan, mera matlab hai lagaam do [Mind your tongue]." The award for Best Scene was presented by Sony Television honcho Kunal Dasgupta, to filmmakers Karan Johar and Nikhil Advani for Kal Ho Naa Ho. And filmmaker Yash Chopra gave away the first Lifetime Achievement Award of the evening to the legendary screen mothers, Nirupa Roy and Sulochana. Politician Amar Singh and the singer trio of Alka Yagnik, Sonu Nigam and Sapna Mukherjee handed over the R D Burman Award to composer duo Vishal Shekhar for their work in Jhankaar Beats. A rocking dance performance by Fardeen Khan was next on cards. Dressed in black and silver Fardeen danced to Janasheen's Nashe nashe. Known to institute new awards every year, Filmfare introduced the Motolook Of The Year, an award for the most fashionable/striking appearance in a film. Rahul Khanna and Perizaad Zorabian announced the nominees, which included Preity Zinta (Kal Ho Naa Ho), Saif Ali Khan (KHNH), Kareena Kapoor (Chameli) and Feroz Khan (Janasheen). The winner: Saif Ali Khan. Two other awards, Filmfare Power Award and Special Performance Award went to Amitabh Bachchan and Shah Rukh Khan (who shared the Power Award), handed over to them by Information and Broadcasting minister Ravi Shankar Prasad. Elder sister Karisma handed over the Special Performance Award to Kareena Kapoor for Chameli. Sonu Nigam and Shreya Ghosal were announced Best Playback Singers (male and female) for Kal Ho Naa Ho (title song) and Jism (Jaadoo hai nasha) by Moushumi Chatterjee and Arshad Warsi. Kal Ho Naa Ho won both the awards for Best Music (Shankar Ehsaan Loy) and Lyrics (Javed Akhtar). Interestingly, this is Javed Akhtar's 13th trophy. "Thirteen is not my unlucky number after all," he said. 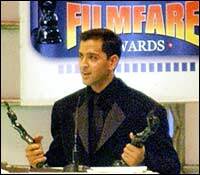 Dino Morea and Sonali Bendre gave away the Best Newcomer Award to Shahid Kapur for Ishq Vishk. Lara Dutta and Priyanka Chopra shared the Bst Newcomer (female) Award. Sporting a leather jacket and a French beard, Sanjay Dutt won the Best Actor in a Comic Role Award for his tapori doctor act in Munnabhai MBBS. Irrfan Khan bagged the trophy for Best Actor in a Negative Role for his performance in Haasil. Queen of oomph Urmila Matondkar declared Bhoot hoon main in a shocking red glittery outfit in a terrific stage act. She later returned to collect the Critics' Award for Best Actress in Bhoot. Unlike other winners, she had only two words to say, "Thank you." Munnabhai MBBS won the Critics Award for Best Film. The second Lifetime Achievement Award went to veteran filmmaker B R Chopra for his outstanding contribution to cinema. The lifetime honour was followed by a surprise for Karisma Kapoor. The blue-eyed actress, who tied the knot last year to Delhi-based industrialist Sunjay Kapur, attended the function with her husband, mother-in-law, parents, aunts and Uncle Shammi Kapoor and his wife Neela Devi. Kid sister Kareena dedicated her performance to Karisma by dancing to the latter's hit songs like Poocho zara (Raja Hindustani), Husn hai suhana (Coolie No 1) and Le gayi (Dil To Pagal Hai). She said, "Whatever I am today is because I am Karisma's baby sister." Throughout Kareena's dance act, the camera shifted between an uncomfortable-looking Abhishek Bachchan (who was to be engaged to Karisma) to a dumbstruck Shahid Kapur (who is reportedly dating Kareena). Fardeen Khan and Malaika Arora presented the Best Actor and Actress in a Supporting Role to Saif Ali Khan and Jaya Bachchan for Kal Ho Naa Ho. After an electrifying stage performance by Hrithik Roshan, Lara Dutta and Jaya Pradha gave away the trophy for Best Film to Rakesh Roshan for his sci-fi venture, Koi... Mil Gaya. Roshan Sr returned on stage once more to collect the Best Director trophy for KMG from Arjun Rampal and Esha Deol.